The HL-85-1227X from Larson Electronics is a 100 Watt Halogen handheld spotlight that emits 2100 lumens. 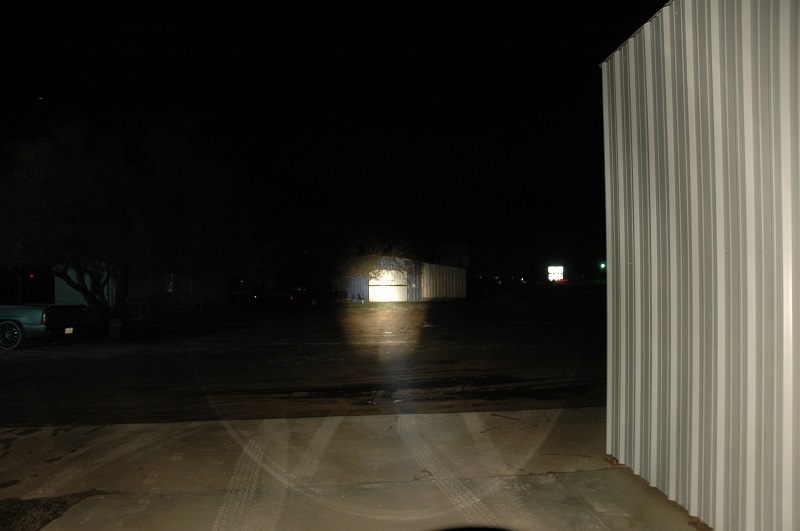 This spotlight produces a beam capable of expanding to 900 feet. 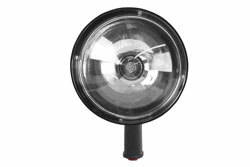 This lightweight, ultra rugged, ergonomic spotlight operates on 110V AC wall plug in. Alternatively, the step down transformer can be removed and operator can run unit off a 12 volt system (with a 12 volt plug-in cord). This unit can be used as a spot or flood light and ships with a 25 foot cord, a 120-277VAC/12VDC step down transformer, and the 100W halogen handheld unit itself. This unit also features a 3-pin Deutsch quick disconnect which allows operators to easily swap plugs regardless of location. Its ideal applications would include recreational boating, fishing, hunting, search and rescue and security and various other applications where a 120-277V AC powerful handheld spotlight is needed. The handle and lamp housing support of the HL-85-1227X are made from high impact nylon. The polycarbonate lamp housing is thick and contoured for extra support. The 16 gauge internal wiring and connectors are simple and well constructed. The industrial grade, tungsten filament bulb is designed for 1200 hours of life while producing over 5 million candlepower in this configuration. The impact resistant polycarbonate lens is lightweight, shatter resistant and thermal resistant. The materials used in the construction of the HL-85-1227X handheld spotlight are UV, water, impact and chemical resistant. The reflector is uniquely shaped and shallow, capturing and focusing the light efficiently and effectively. Combined with a convex lens and inset lens positioning, this light optimally and efficiently captures and projects the right amount of light where the operator wants it. The position of the bulb and the shape of reflector are different than most handheld lighting products. The difference is in how much of the emitted light is captured and focused. In many ways, light shares the properties of water. With many spotlights, a great deal of the light "spills" on the ground around the light source. While a beam continues to project, much of the light "spills" out around the source, robbing the desired, projected beam of power. With the HL-85-1227X spotlight configuration, 90% of the emitted light is captured and focused. A side benefit of this is a reduction of "casting", a phenomenon that occurs when the light "spills" around the light source. Often times, when surrounded by water, snow or other reflective surfaces, the light spillage will cause "casting" which effectively prevents the human eye from adjusting and seeing the objects at distance the spotlight was used to see. The operator can lift the locking tab behind the lamp housing and rotate the lamp head. Rotating the housing enables the operator to adjust the beam from a wide, soft flood pattern to a tight, spot beam that goes out to 900 feet. Continued rotation to the extreme disconnects the lamp head from the handle assembly, enabling the operator to replace the bulb when necessary. 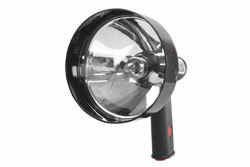 The HL-85-1227X is an ultra-durable handheld spotlight that weighs only 13 ounces, which makes it easy to carry and operate. The unit is balanced for ergonomic comfort and handling. The handle is 4.5 inches long, 1.5 inches deep and 5/8 inch thick, making it easy to hold, even in wet, slippery conditions. The nylon handle has a no-slip textured surface to improve grip as well. The booted push button is conveniently placed so the user can easily access the switch with their fore finger for quick on/off action.